It will take me some time but eventually we will have information about each one of the 200 teas presently in the shop, including the new ones that I keep finding, ( I have never met a tea that I didn’t like, although there are some I like better than others). Each tea has its own Magic, its own appointed task to accomplish, very much like herbs, spices and incense. Some are relaxing, some healing, soothing nerves or upset stomaches, and some are energizing like the one we are featuring today. Are you looking for a quick pick-me-up in the morning? Or feeling like you need a mid-afternoon boost for those long days at the office? EnergyTea to the rescue! This delicious, sweet with a spicy-minty bite, tea rolls over the palate like a tidal wave, filling the mouth with a pleasant herbal astringent. Wow wake up!Gynostemma lends the sweet profile: a leafy plant known by herbalists as a miracle grass, herb of immortality and the fairy herb. Ginger is known to speed blood circulation and stimulate the body. Peppermint has the ability to perk up even the sleepiest of us while delivering high levels of vitamin A and C. Peppermint’s elevated levels of menthol are responsable for its sweet/hot flavor that can heat up and cool the mouth at the same time. The addition of natural Lemon, Lemon Grass and Green Mate complete this rousing tea, an herbal blend that really creates a cup of vim and vigor and puts a gleam in the eye and a bounce in the step. Visit the Funky Karma Incense & Tea Shop and try a cup of this invigorating tea: take home an ounce or two for those times you are tired but need to keep on ticking – it’s equally as effective hot or iced. After thinking things over this week I decided to make a new Herbal Incense Blend to help with the healing that the earth needs at this time. All of us are concerned about the awful Gulf oil spill and want to be able to do something, anything that will help. This new blend has sweet alyssum from my garden to add sweetness to earths travails, red geranium (from Pluma’s Auntie Jill’s garden) used for love, healing and fertility , white sage for protection of earth and workers involved in cleaning up and stopping the flow of oil, rosemary so that the earth can remember herself healed, and star anise to bring about changes in attitude: a re-focusing on the problem with new insights for solutions, and other magickal ingredients. 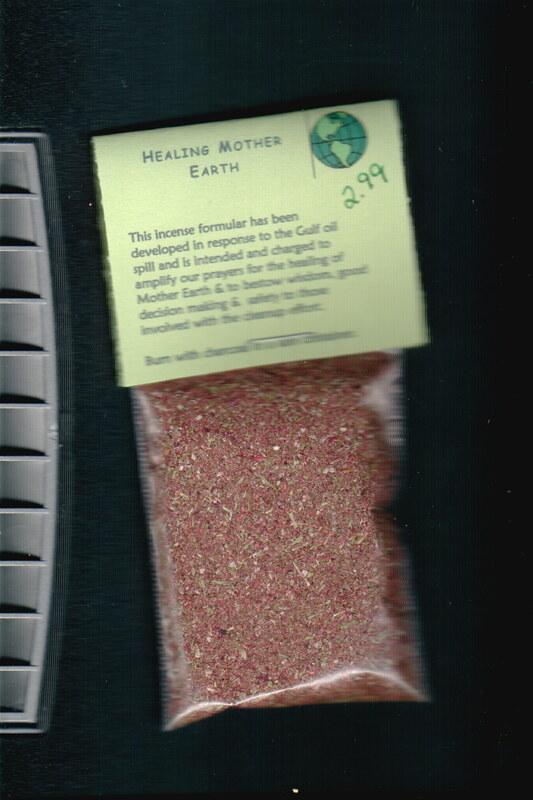 Use this incense when you are thinking or praying for the gulf, the people involved in the cleanup and the fish, birds, insects, and reptiles affected by the oil. It is meant to be burned on charcoal in a safe container and is available in the Funky Karma Magic Shop now. On Sunday June 13th, 7pm, at LaLiorona Park, on Picacho, the south side of the bridge, there will be a prayer and drumming service for Healing of Mother Earth. If you are in the area please plan to attend. Today I found this eloquent request for prayer for our hurting Earth, I hope that everyone will take the time to join with all others in this healing endeavor.